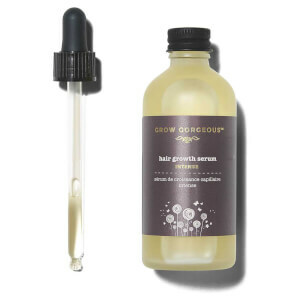 Get protected, luscious hair with the Grow Gorgeous Hair Growth Serum. Intensely formulated to encourage hair thickness, the concentrated salve leaves hair looking longer, whilst feeling fuller, healthier and thicker. Made with an active complex that combines Acetyl Tetrapeptide-3 and Clover Flower Extract, the serum works to create visible results within four weeks. 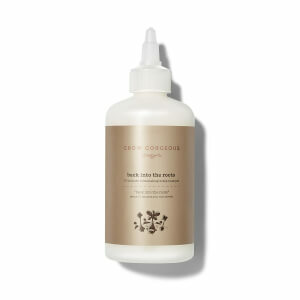 Infused with Hyaluronic Acid to moisturise your scalp, it also contains a Bio-Active Pea Sprout Complex and a Bio-Active Complex of Chinese Skullcap, Soy Sprout and Wheat Sprout, helping to activate and diligently improve hair density. Free from parabens, silicones and sulphates. Please Note: This product is available as Hair Density Serum in certain markets. The product formulation is the same in all markets. On towel-dried or dry hair, apply 20 drops to the scalp and massage well. Divide your hair into four sections and apply 5 drops from the pipette directly to the scalp along the hair line in the first section, massaging well into the scalp. Smooth any excess product through the lengths of your hair. Repeat this on the remaining three sections, applying 20 drops in total. Do not rinse. Aqua (Water), Pentylene Glycol, Butylene Glycol, Propanediol, Arginine, Lactic Acid, Sodium Hyaluronate, Dextran, Glycine Soja Germ Extract, Triticum Vulgare Germ Extract, Daucus Carota Sativa Extract, Acetyl Tetrapeptide-3, Trifolium Pratense Flower Extract, Gluconolactone, Pisum Sativum Extract, Scutellaria Baicalensis Root Extract, Caramel, Sodium Benzoate, Calcium Gluconate, Phenoxyethanol, Chlorphenesin, PEG-40 Hydrogenated Castor Oil, Parfum (Fragrance), PPG-26-Buteth-26, Alpha-Isomethyl Ionone, Linalool, Limonene¸ Butylphenyl Methylpropional, Hydroxyisohexyl 3-Cyclohexene Carboxaldehyde.